It’s already Summer Solstice. It’s amazing how quickly time passes. I was afraid when I “retired” from my archaeology days, and decided to do jewelry full time, that I would sit around with time on my hands and just stare at my bench pin. Well, not exactly. My days are packed with discussions with my friends about techniques, stones, and preparing for art shows. I don’t have time to do anything else, (and have been so tardy about updating my blog) and though it gets frantic at times, I’m extremely grateful to be able to pursue my passion. I think my life is very blessed. This past week end, I took one of the most amazing workshops I’ve ever taken, in fact, my first workshop in 3 years. I took this eagerly awaited workshop because I have long been a fan of master metalsmith, David Huang. 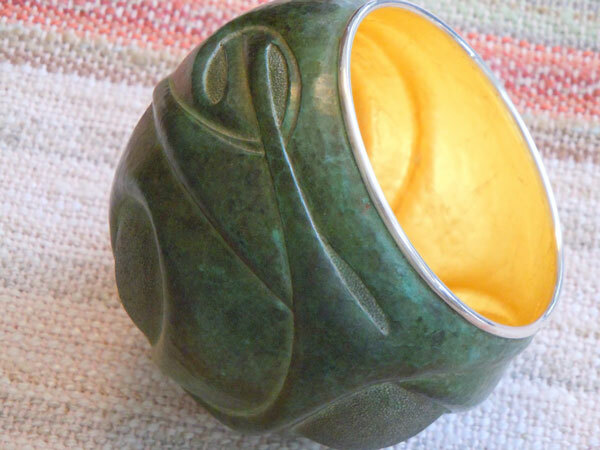 He makes those fabulous chased and repoussed vessels, with those “out of this world” patinas. Then they are lined in gold. They positively glow from within. I first saw them several years ago in Metalsmith magazine, and have longed to see one in person. His pieces are truly the kind of art that you just stare at with your mouth open and say “How does he do that?” I knew two days of chasing and repousse would tax my dyslexia, not to mention my shoulder, but I really wanted to know how he got those fabulous patinas. I must be doing something right because The Denver School of Metal Arts, where I also teach, hosted the first ever patina workshop that (gasp!) the real David Huang presented. 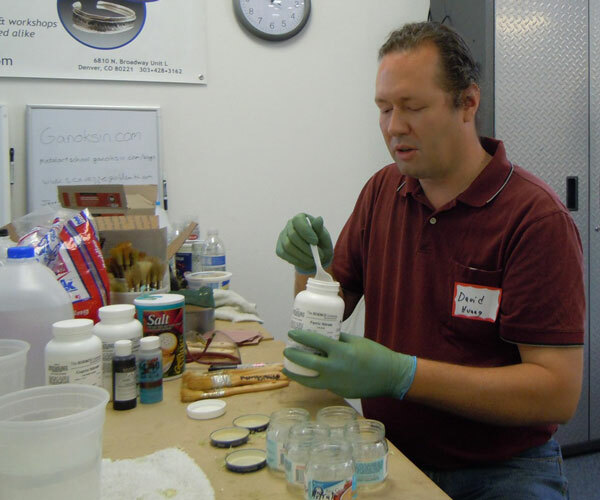 I had met David last year at the Colorado Metalsmith Assoc Salida Conference , which takes place in mid-July each year. David and I were sitting close together in one of the presentations, and (embarrassingly) I just had to gush. I mean, he’s truly an unbelieveable artist. He was so gracious, (not to mention, very good looking, too), much too young to be such a master metalsmith, and one of the nicest guys in the field. But I digress. The first few minutes of any workshop are rather awkward, with people not knowing each other, or the instructor. David put us at ease immediately with his self-deprecating humor, and talking about his work. He’s very humble and allowed all questions. As he started to talk about the chemicals I tried to remember chemistry class of….hmmmm, say “several” years ago, but he speaks like a real person, not “chemical engineer speak”. Also, I was expecting a massive Bible of technical recipes as hand-outs, kind of like that patina book that I own, which I either (a) can’t afford or (b) can’t pronounce the ingredients, but no. We started out with basic ingredients that all of us had already had heard of, and, I was fairly sure, would not accelerate the growth of a 2nd head. David fired up the torch, applied the patina, and we all stood around and “oohed” and “ahhed” as the metal turned a juicy turquoisey-greenish blue. But the master of any technique can make it look simple, right? Then was our “hands on” time. I cut my metal, got my little jar of chemicals and was at last “one with the torch”. I eagerly fired up the torch to a soft annealing flame, heated the metal, reached for a paint brush and cautiously applied the chemical and waited. Nothing. Absolutely nothing No color. Nada. Zilch. David looked over my shoulder and said “More heat”. “More?” He reached over and cranked up the heat. I applied more chemical. There was a tiny bit of green, but only if you looked at it under a 4000X power microscope. “More stuff”, I heard, as the master was standing right there. So I slathered the “stuff ” on, and there it was, just baby steps, but there was a green. It didn’t look like his, but there it was. So I stood there adding more “stuff” and more heat. Suddenly, there appeared this luscious turquoisey-green. “Oh Wow!” escaped from my lips, and I gazed upon my first tile as if it were my first newborn child. Around the room my classmates experienced their own color-induced euphorias. Soon we were all comparing our sample tiles, and eagerly reaching for another. David showed us more patinas, we practiced and experimented, and suddenly someone announced it was lunch time. No way! 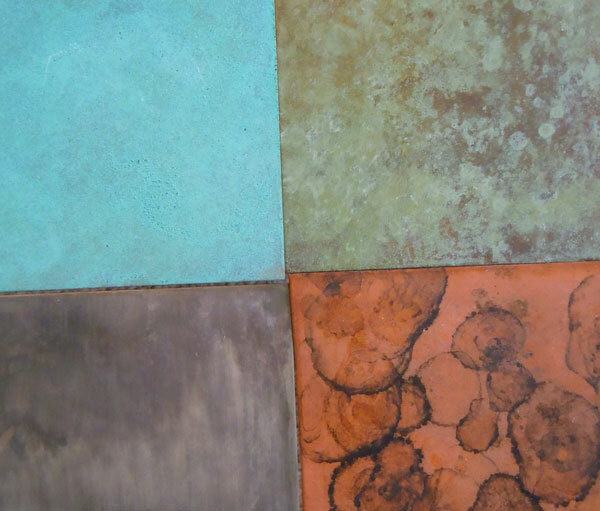 I had about 7 tiles with different patinas….a rich green, an olive green, a forest-y looking green, and a deeply polished leather brown, something that looked like my old saddle for my childhood horse. That quickly became my favorite patina. Not one “failure”. By now we were all friends, sharing patinas and how we did this or that, “oohing and ahhing” over each others test tiles. All too soon the day was over. I had 13 fabulous tiles. That night I was exhausted and fell asleep in my chair at 9:30. I was eager to get to back up to the school the next day and buy more metal at The Naja, and some little copper bowls, too. I wanted to get there early to look at the vessels he brought, and actually get to touch one. That day David showed us a deep velvety black patina, so much richer and deeper than Liver of Sulfur. As he encouraged experimenting, he was just as excited and surprised as we were with some unexpected results. He was very honest if we asked about putting this chemical with that, and he’d say “I never tried that. Go for it.” How refreshing. David is a very giving teacher. He shared every secret, every possibility and even talked of chemicals he wished to try in the future. I also try to teach that way and really appreciate when someone who I consider a true master is so giving. My philosophy is “Why make students re-invent the wheel?” My last patina was a real surprise….a rich, elegant pinky-red-salmon, and a pattern that could be an O’Keeffe painting. On the back of the tile, by happy accident, were colors that looked something like a Rothko painting with rich purples. That I will just put on a mini-easel and just look at. It had been one of the most wonderful workshops I’d ever attended. I’d like to thank Darlene Armstrong and Travis Ogden and everyone at The Naja and Denver School of Metal Arts for bringing in an artist of David Huang’s caliber. Though my styles of jewelry will not change, you will be seeing a lot more color. “Knock your socks off” color. Thank you, everyone, and a very special Thank You to David for sharing. As we packed up, I was able to purchase the vessel which I loved with all my heart. It fit perfectly as I cupped it in my two hands. Have you ever wanted something so much that when you got it, the only thing you could do was stand there and grin at it? Well, that was my feeling as I chose and packed my beloved new treasure. I have looked at this piece, dreamed of it, and longed for it for at least 3+ years. It’s that magnificent turquoisey green that I love, and the gold interior just glows. It smiles back at me. David graciously let each of us pick out and have some of his tiles, and I’m honored to have my favorite 4. Those, and my test tiles are all on the dining room table, with my gorgeous vessel. I just go down and stare at them and grin. Yes, my life is very blessed.